House set high up overlooking 35 miles of Umbria and Tuscany. POPARELLO 2 Bedroomed Air-conditioned Apartment is set in 5 acres of the Umbrian Countryside, close to the village of PACIANO. The apartment has two air-conditioned double bedrooms, set out as a master double and a twin room, but there is room to accommodate a further single bed or two cots within the apartment. The second bedroom can also be converted to a double room. There is a full kitchen, with cooker, gas hob (4), fridge with small freezer compartment. and full size dishwasher. There is a smart TV, DVD player, along with many films and free wi-fi. All bed linen is provided, including luxury bathrobes and pool towels. 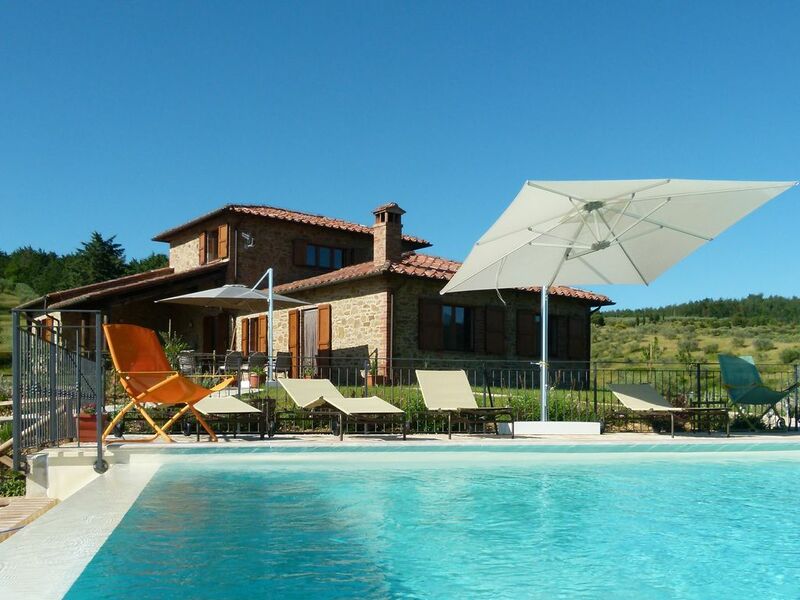 There is a 12m by 6m infinity pool, overlooking 30 miles of countryside into Tuscany. Access to the pool is easily accessible, but there is a safety gate, to prevent children wandering into the pool area unsupervised. There is a young childrens' play area, also a games room for older children. The apartment boasts two terraces, one east facing off the master bedroom, with the west facing terrace there to catch the sunsets and is the main outside eating area for the apartment, however there are two further communal eating areas, one under the portico and the other south/east facing to make the most of the views and warm sunshine. There is a further terrace for use using the barbeque. Laundry facilities are available at a small charge. There are full and half board options, with pick up from a range of airports, if required, including Perugia, Rome Ciampino, Rome Fiumicino and Pisa possible. The apartment also has a range of novels, maps and comprehensive guides to the local area and the main tourist sites. We offer guided tours, and will arrange wine tours and cookery courses. There is riding school nearby, with trekking right past the house. For the more adventurous there is white water rafting nearby and many other activities on Lake Trasimeno. There is a water slide park within 20 minutes at Tavernelle. We have had a complete career and culture change, switching from a successful physiotherapy business in the UK, to a business in beautiful central Italy. It is difficult to explain until you arrive and everyone who comes then realises the reasons for our choice. Silence, apart from bird song. Little light and very low general pollution. Magnificent view. The perfect place to unwind, but with local events close at hand. Motorway and rail links close by, with a number of airports within 2 hours. Closest Perugia, 50 minutes by car. Telescope for star gazing. Early in the season you can, if lucky, see wild boar, porcupine, eagles, deer, red squirrels, and numerous species of birds. In June, we have fireflies for about 10 days. Our second time staying at Poparello and I’m sure it won’t be our last. Our lovely hosts Geoffrey and Judith made us all feel so welcome and like part of their family. Nothing is ever too much trouble and they both have an abundance of knowledge of the local area and beyond. The pool is all you could ever wish for with the panoramic views making the location even more special. The air conditioned accommodation is outstanding, well kept, spacious, well equipped and spotlessly clean. We all had such a relaxing time and didn’t want to leave. Poparello really is paradise on a gorgeous hillside in Umbria. We were so pleased to see you again at Poparello. Delighted you enjoyed the time with us and hope to see you again in the future. There are many local events and festivals through the year. We give a list of events about two weeks before the holiday, including food, wine, sporting, musical, flower and other functions. There are so many local festivals from early May through to October. Amazing flower festivals from March to mid June, with sporting and jousting competitions, boat races, barrel rolling, with many archery and crossbow palios until late September. Most famous is the Palio in Siena, July 2 and August 16. Just over an hour away. We can arrange transport and tickets for most of the events. Umbria Jazz, the largest Jazz festival in Europe takes place in mid July each year in and around Perugia. Chocolate festivals and other food festivals abound.